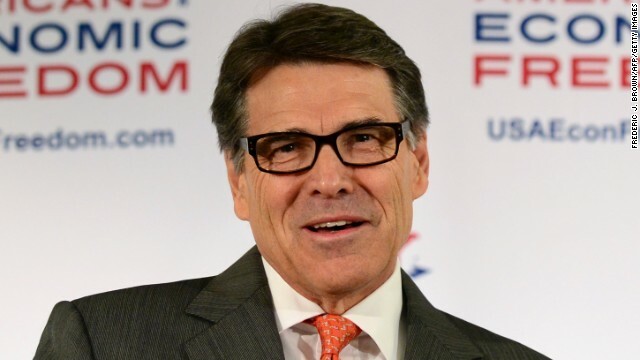 Washington (CNN) – Rick Perry, the Texas governor and erstwhile Republican presidential contender, played host on Tuesday night to more than a dozen well-connected New Hampshire politicos – his latest effort to woo GOP power brokers as he plots a repeat bid for the White House in 2016. The confab, held over dinner at the governor’s mansion in Austin, was organized by Republican operative Mike Dennehy, Perry’s man-on-the-ground in New Hampshire, and included several business leaders and Republican activists from the nation’s first primary state. Miller and another confidante, Henry Barbour, accompanied Perry to the dinner. Among the attendees: former Rep. Frank Guinta, who's running for his old congressional seat, New Hampshire GOP Vice-Chairman J.P. Marzullo, state Rep. Laurie Sanborn, investor Fred Tausch and real estate developers Dan and Renee Plummer. It’s not the first time Perry has invited well-connected Republicans to Texas for a charm offensive as he works to repair his national image in the wake of his disastrous 2012 campaign. Perry has attributed his poor showing in that race – highlighted by several off-key debate performances – to lingering pain from a major back surgery and his lack of preparation for the grueling rigors of national campaign. This time, Perry is starting early in hopes of avoiding the same mistakes. His aides have invited a slew of donors and elected officials to Austin over the last year for face-time with Perry, including Iowa Gov. Terry Branstad, key Republicans from the primary state of South Carolina, and members of his 2012 campaign committee. The governor, who declined last year to seek another term as governor but maintains a leading role in the Republican Governors Association, is also keeping up a robust national travel schedule, meeting with potential financial supporters in the process. He’s in Iowa this week campaigning for Branstad, up for re-election this year, and Senate candidate Matt Whitaker, one of his backers from the last presidential race. After a vigorous campaign in Iowa, Perry finished a disappointing fourth in the 2012 caucuses. Perry barely contested New Hampshire – and garnered barely 1% of the vote in the primary before dropping out of the race in South Carolina. His meeting Tuesday signals an intent to take the notoriously fickle Granite State more seriously if he runs again. “While the Governor made no commitments on a possible presidential run in 2016, he made it clear that if he does decide to run he will be prepared this time,” Miller said. Other dinner guests Tuesday included conservative activist Shannon McGinley, attorneys Bryan Gould and John Lyons, Manchester school board member Robin Dunphy, state Senate candidate Howard Pearl, and Paul Chevalier, a plugged-in member of New Hampshire’s veterans community. Mental Health depends on Gun Ownership ? THE NRA IS NOT IRISH ! Talk about not being able to fix stupid, here he is! 1. Jodi Ernst castrates a pig. 2. Ted Cruz pets a tail wagging pig. 3. Rand Paul dresses himself in a baseball uniform. 4. Rick Perry dines in New Hampshire. GOPerville is pulling out all the stops. Well, the justification for Perry running again ought to be amusing. Can't wait to see who posts in support of him, especially since he's no longer conservative enough for TX GOPers. He must be delusional if he thinks he is ever going to be POTUS. Why is he even putting himself and his family through this exercise in futility? Rick, you've been Governor of Texas for more years than I care to remember, but now it's time to get on that horse and ride off into the sunset! One does have to question why he's not running for Governor again... the only reason that would happen is if he got a bigger deal or a swelled head... Follow the money.. it's the GOP way. They can take him back with them. --you mean Namratha Radhavva haly? Or peeyush zindol? It is tax payer dinner? Booga boooga bo0ga W.H. noless a cook in backyard non-sense i say ? to deport everbody ? Dumb is Dumb, and there's no way around that....I'm from Texas and Rick Perry and Bush '43 could play in a new version of Dumb and Dumber.....daddy Bush was the other smart one out of the bunch! Rick will definitely keep the comedians with new material!!! Article: "Obama has ticked off the Hispanic community by stalling on executive changes to immigration policy so it doesn't interfere with Conrgess." Idiot Teatroll: "Obummer is pandering, letting the illegals dictate his immigration policy." Do you guys even read the articles or is it all just a wonderous game of let's-pretend time in your heads, where you get to invent what's going on in the world so that it magically confirms all your preconceived notions? Would someone please tell him to take off the glasses. We all know how stupid he is so trying to make him look smarter isn't fooling anyone. I can't decide if Cowboy Fonzie thinks that makes him look smart to be wearing those glasses or if he's been bitten by the hipster bug as part of some "life change" crisis. Next thing you know he'll be using Neutral Milk Hotel songs as his campaign theme and sporting a manscarf while holding press conferences at Starbucks. Maybe the state of New Hampshire can MOVE to the paluted state of Texas and help clean up that cesspool !!! !